Hunting for top notch wild hogs or boars need the best broadhead for hogs. Without the proper hunting weapons, you won’t have the chance to capture your prized catch with accuracy and precision. While most hunters choose to have a rifle or even a dog as their ally, there are those who still go for the traditional bow and arrow to hunt wild boars, hogs and even game. But you also have to take note that choosing the right broadhead for your arrow is not as easy as some people may think. Hunters can’t just walk into a hunting supply store and choose the first arrow head that they see. There are specifications that these broadheads must meet before they can be declared the best. Because we aim to help you make the best choice for your boar hunting needs, let’s all take a closer look at each of these brands and models. These reviews were based on the specifications that we have enumerated above. Whether you are on a tight hunting budget or not, it wouldn’t hurt if you choose the best priced broadhead for your arrows. Not only will it help you save money, you will also have more leg room in terms of design, composition and durability. Slick Trick Magnum 100 GR Broadhead – if you will be basing your decision on price alone, you will notice that this is priciest one among all three brands on the list. However, if you look closer, each pack is made up of 10 broadheads. It simply means that the price may be higher but the number of arrowheads are far greater than the rest from our list. Excalibur Boltcutter 150gr SS 3Blade – each pack comes with 6 broadheads, perfect for multiple shots. However, it cheaper and has a lesser head count than the Slick Trick Magnum Broadheads. 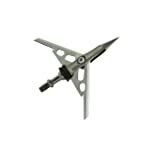 Rage Hypodermic Standard Broadhead, 100-Grain – only comes with 3 broadheads, which is lesser than the other 2 on our list. This model, on the other hand, offers great precision and durability that we cannot ignore the fact that it is worth trying, despite the lesser headcount. Another good reason to purchase it is because it also comes with a bonus practice head to get your aim straight before that big hunt. It’s undeniable that the materials and make of every single product that we purchase play big roles in our decision making. We need to take note of the fact that if it is made of low-grade materials, the product will not perform the way we expect them to perform. Excalibur Boltcutter 150gr SS 3Blade – this 150 grain broadhead is made up of stainless steel that is not just hard enough to withstand hard hits, thick skin and flesh as well as penetrate through bones; it is also made heavier to add more impact and momentum to the arrow as it hits the target. Great for heavy targets just like boars, elks and moose. Rage Hypodermic Standard Broadhead, 100-Grain – also made with 100 grain, top notch stainless steel just like the Excalibur and the Slick Trick brands. It’s .35” thickness also works well for slicing through skin and meat with ease. Slick Trick Magnum 100 GR Broadhead – the Slick Trick is made of 100 grain German Stainless Steele Ferrules, considered to be one of the world’s best in terms of sharpness and durability. The steel blades are about .035 inches thick, hunters can be sure the blades are thin enough to penetrate. Every other criterion will surely go to waste if the broadheads do not last long. So it is important for use to make sure that the broadheads will last more than 1 hunting trip. 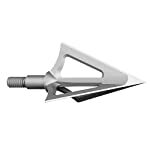 Rage Hypodermic Standard Broadhead, 100-Grain – the hypodermic blades have a tendency to break and crack if fired without the proper leverage. There have been accounts of the tips even breaking off when the broadheads hit bones and even trees. But these are rare occasions, most of the hunters who have claimed satisfaction with the product are proud to have used and reused the broadheads without any chips, cracks and breaks. We are advised to make sure that we buy the original ones since there are several counterfeits scattered around the web. Excalibur Boltcutter 150gr SS 3Blade – there are several factors that lead to damaged broadheads and one of which is really hard and fast impact and the other would be high speed bone crushing impacts. The Excalibur definitely lives up to its name, durability wise since it can hit really hard surfaces such as propane tanks, animal bones and thick hide and they will still come out undamaged. Slick Trick Magnum 100 GR Broadhead – made of high grade Lutz blades, they are known to be super durable. And despite the fact that they fly and hit targets at really high speeds, the blades will not bend and will easy push through fur, skin, flesh and bones without the blades being damaged. The Slick Trick Magnum definitely comes almost at par, if not better than the Excalibur. 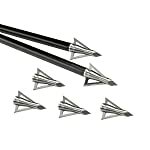 The overall design of each broadhead affects its performance. It is not just about how the arrows look, but one must also consider how they are made – number of blades, shape, size, precision of hit and sharpness. 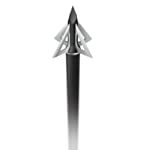 Rage Hypodermic Standard Broadhead, 100-Grain – with only two blades, the Rage’s looks can be very deceiving. counterfeit issues aside, they are ultimate performers. The double blade design can definitely help in increasing its speed because it is lighter than the 3 or 4 blade arrow heads. In addition to that, its chiseled arrow tip will help penetrate through thick skin, meat and bones accurately and quickly. Because the edges are smooth, it will cause less damage to the skin and meat – but make no mistake, this broadhead can definitely kill. Slick Trick Magnum 100 GR Broadhead – compared to the Rage Hypodermic Broadhead, this has 4 blades that guarantee your desired results with utmost accuracy. It uses the Alcatraz blade lock system which keeps the blades and the heads in place. Excalibur Boltcutter 150gr SS 3Blade – if you are looking for a heavy duty broadhead that is heavy enough to cause deep penetration and light enough to swiftly hit your target, then the Excalibur should be one of your top choices. It doesn’t shoot too high or too low because of its 150 grain steel blade composition. Like what was stated, the hunting heads are heavier to ensure precise hits and devastating impacts. Making decisions that could affect the outcome of your next hog or boar hunting trip can be really challenging. With so many brands and models promising the same results, it is not surprising that you will get all confused and torn between one type and another. By looking into each brand and model’s specifications, you now have the power to really choose which ones you really want to use. But there is one favorite that emerged through this, the Excalibur Boltcutter 150gr SS 3Blade definitely earned a spot in the best broadhead for hogs class and has surely made a mark not just in terms of overall design, but also in performance, durability, and make.